After the 10.1-inch Honeycomb Tablet leak by Lenovo, it seems that Lenovo has tons of devices in its kitty. 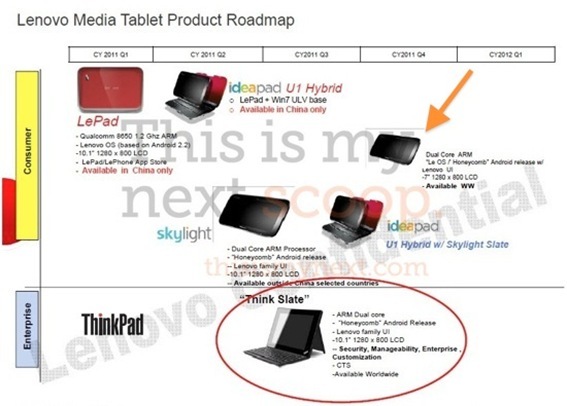 According to Thisismynext’s recent scoop, Lenovo seems to be prepping up for a 7-inch Honeycomb tablet as well. The tablet is expected to be launched during the fourth quarter of 2011, Thisismynext predicts that Lenovo might even launch it earlier. Although there’s surplus amount of 7-inch tablet in the market, knowing Lenovo we know we wouldn’t be disappointed with the build quality of the product. More than that we are more excited to see how Lenovo’s custom UI on the top of Honeycomb performs. Google has a complete makeover with Honeycomb so that manufacturers wouldn’t feel the need to design custom UI and mess up with the update procedure yet none of the Manufacturers seem to follow Google and want to distinguish their product from their competitors.